What's a Project Manager's Actual Job? Project management is easier than ever before but being a project manager somehow became tougher. Why is that? Software automated a lot of the work, but the way project managers use that time and a concrete value they provide became questionable. In other words, many people think project managers don’t do anything except boss people around and waste time. The trouble is, they’re not that far off. Ask a typical team member "What's a project manager's actual job?" and they won't be able to exactly tell you. They know the textbook definition: a project manager manages projects, coordinates people, communicates objectives, allocates resources, monitors processes, etc. But what does it REALLY mean? Well, in the eyes of Joe the developer, project managers don't do anything. Anything useful, that is. In the best case scenario, a project manager doesn't waste other's time; they just sit quietly in their corner, creates to-dos, and don’t bother anyone. Developers and designers - the people that actually create things - think they would be much more productive without a project manager. This is not anecdotal evidence. 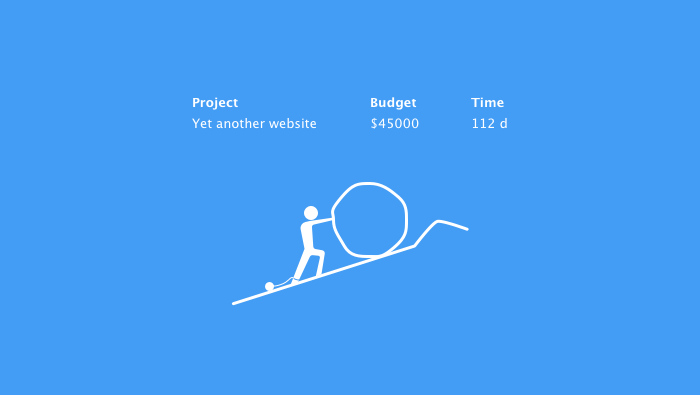 The perception of project managers as professional time wasters is well documented. What happened in Pixar is one example. When their team finished Toy Story, it was a stellar success. But Pixar's founders had trouble convincing project managers to stay and work on another film. Why? The project managers described their job as a nightmare. They were constantly disrespected, marginalized, and treated like second-class citizens. When management asked artists and technical staff if that was true, they confirmed it. The team felt project managers impeded good work by over controlling the process, micromanaging, and throwing sand in the gears. And this came from a team who made one of the most groundbreaking and successful animated movies of the decade. Not only did the team deliver a product under extreme deadlines and budget, but they made one of the greatest movies of all time AND had to come up with a new workflow (feature length 3D animation was a completely new field and there were no standard workflows the team could rely on). Of course, Pixar's management did everything they could to fix the situation. But it took them time to see the problem and since then, they constantly work on it to make sure it doesn’t happen again. But other organizations either don't have the time to do that or don't want to admit anything’s wrong. They happily trudge along and focus on the next project, while employees put up with bad management or quit once they’ve had enough - and you can guess what the best workers do. To solve this problem, project managers need to know what their real role in a company is and what value they bring. A project manager's role depends on the company size. For example, if you’re a small development agency, hiring a senior project manager from a big company is a terrible choice because of the rhythm and skills mismatch. In a startup, a project manager has to do a lot of different things, plus be the one responsible for driving work forward. But in larger organizations, they have a more reactionary role. They wait for emails to come in, for a phone to ring, for meetings to get scheduled, for reports to get filed, and deadlines to get close before stepping in. In big companies, there’s always someone who asks for their attention, so they expect the same at a smaller scale. But that doesn’t happen - it’s the other way around. The things they're good at (like complex decision-making, prioritization, organizational design, process improvement, and organization-wide communication) are not needed in a startup because there are no processes to improve - only processes to create from scratch. Small companies also need domain expertise and creativity for initiating new directions. In a smaller company, a project manager will have to do all sorts of things in addition to managing projects: create wireframes, send assets to developers, write bug reports, fix CSS, answer emails, organize Photoshop layers, write manuals, do SEO audits, etc. If a project manager is not a jack-of-all-trades, they won't fit in at a smaller company. Project manager's responsibilities are many, and benefits are few. If you want to succeed as a project manager, you have to be passionate about making others more productive, even if it comes at your expense. Project manager and account manager are often the same person. They act as a liaison between the team and the client. Because they have more contact with the client (and are the closest to the source of power), they are susceptible to the "boss" syndrome. They can feel like they can decide what and how should be implemented without consulting with the team. Project managers with a "boss" syndrome feel best about themselves when they figure out “how” to do the project. On the other hand, good project managers just clearly define the “what”, let the team decide the “how”, and then manage the delivery. For instance, a project manager shouldn't decide to use Laravel as the app's base without first consulting with the team - they should tell what the app needs to do and then let the team suggest the best framework. True story: there are project managers who use Wordpress as a framework only because of its database; this is like buying a car just so you can get to your neighbor's house - sure you can do it, but is it worth the overhead? Because a project manager’s only goal is to create the right thing within time and budget, there’s a misconception that they're more important than anyone else. But it's not true. Project managers are not the most important, just the most responsible. "If a project fails, it's because of a bad project manager; if a project succeeds, it's because of a good team." A project manager is not the "boss" of the team but the "boss" of the project. A developer may answer to a senior developer or manager, but their employment is not in the hands of the project manager. All the project manager can do is suggest who to hire or promote, but not do it single-handedly. Project managers don't have a large role in the final outcome of the product, but do have some influence on the direction. A project manager has to weave a client's wishes into the design and has to ask for designer's assistance. So, the end product is a result of the designer's effort and the project manager's influence. This can lead to identity crisis. They can’t directly control how a website or an app will work or look like, but they are held responsible for the final result. Also, when it comes to presenting the work, they are expected to know and talk about everything like they were the ones to create it. So project managers are tempted to hijack work and micromanage to relieve this existential pressure. But it rarely ends well. Hybrid project managers who can both manage a project/team AND design/develop are extremely rare. Because a project manager is a jack-of-all-trades, they can feel like they can design as good as the professional - and so they do it. But when they start being too involved with the design, other departments take a backseat. This leads to crunch time, a drop in morale as other team members start feeling neglected, and the overall deterioration in communication. The trick to surviving as a project manager is to keep the ego in check and not fly too close to the sun. All you can do is influence the outcome and create by proxy. It can be extremely frustrating, but it’s something project managers have to learn to live with. There are two types of products: perfect products and products that ship. Everyone on the team has to make tough decisions. The decision a project manager has to make is whether to ship an incomplete product or fall behind schedule. Priorities change each month and project managers have to anticipate what will be important next month and make tough calls on the spot. While different departments have and fight for different goals, you have to make sure no one wins. Designers may want flashy animation and developers faster load time, but you can't have both. You have to walk a fine line and not let anyone “improve” the work at the expense of the whole. The moment one side wins, the project fails. You're the only one who has the official duty to think of the big picture. A project manager is like a parent to their team, and not in a "oh how wonderful it is to be a mother/father" way. You get all the downsides and barely any upside. Like a parent, you always have to be there for your children, no matter how tired or angry you are. You have to support and protect them, teach them how to take criticism, and make unpopular decisions when needed. When a client doesn't like the work, you have to break the news to the team. When you're working on a project, you have to be critical and point out what's wrong, what's right, and represent the client's interest. This often means pushing your team to come up with a better solution. It's your job to inspire them to rise above mediocrity and become better. But when you're representing your team's work to the client, it's your job to defend them - even if you disagree with some decisions. You may personally agree with your client, but your job is to represent your team. Anything less would be betrayal. Work is a team effort - if a client starts criticizing the work, a project managers can't throw their team under the bus and side with the client. Sometimes, your kids will barely acknowledge your presence. Or, they'll talk behind your back and say how you're no fun and simply don't "get it". But you have to swallow your pride and keep performing your parental duties the best you can. So, like a parent, you won't be very popular. When you're with your team, you represent your client; when you're with your client, you represent your team. You're never one of the guys, and some people will subconsciously take it against you. And just as a parent, you have to do what's good for them - not what's popular. With that said, you do need some popularity points in order to gain their trust and make work smoother. This means giving credit, saying "good job", complimenting on a specific detail, etc. In other words, you need to be a cheerleader. But beware not to descend into fake flattery. It's better not to say anything than say something you don't really mean or else you'll lose integrity and trust. Team members are inherently distrustful of project managers because they don’t actually create anything. But you do one thing no one has the time to do: you make sure everyone is on the same page, at all times. Sometimes, you'll spend your whole day just making sure people two desks apart are working on the same thing. You have to know at each moment who’s working on what, who’s on vacation, who’s sick, and which teams are understaffed. Any time the team is shorthanded, you have to find someone to fill in or do it yourself. To fully utilize your resources, you have to know everything without trying. If someone has a question, you should be the first person they think of. Getting this kind of reputation is difficult, especially if you don’t have a technical background. But you don't want your developer to waste time trying to figure out how to restore their Git commit if you have someone who’s a guru on the subject. A developer shouldn't trouble themselves by getting to know every other developer's core competencies. But a project manager should so they can immediately hook up the person who needs help with the one who can provide that help (or at least know how to find that person). Gathering knowledge takes time, but the more things you know, the more stuff people will tell you. In addition to networking and keeping an open ear, you should systematically centralize information. This includes keeping the contact list, updating internal wiki, and managing the project management software. Big organizations move slowly because projects are so easy to delay. All it takes is one person: a developer may be stuck waiting for requirement clarification or a manager may need to be consulted before approving an expense. All these seemingly minor hesitations slowly delay projects. One hour here, one hour there, and your project will end up slipping a month behind schedule - and you'll wonder how that happened. The only way to stop those little, harmless hesitations is to constantly work on removing roadblocks. So if anyone's stuck on anything for any reason, a project manager should work on resolving the issue. The less time a task spends in "waiting for approval" phase, the less likely you’ll slip behind schedule. A project manager's job is to take non-work of their team's back so the team can spend more time designing and developing (i.e. the actual reason they're hired). You don't make your team more productive by organizing meetings and asking for reports - this makes your job easier, which is a completely different thing. Protect your team from outside work and they'll naturally become more efficient, without attending a motivation seminar or enforcing more regulations. Do everything in your power to protect your people from meetings, extra work, or "quick consultations" for other teams. Also, while designers and developers are expected to focus solely on tasks within their field, you're the one who should do odd jobs, like booking meeting rooms, sending reminders, taking notes, entering tasks, and makings sure the videoconferencing system gets fixed. You should also work on optimizing processes. In poor organizations, people spend much of their time fighting organizational boundaries and broken processes, navigating through red tape, and dodging conflicts. Sometimes, they're not even clear what their job is, if they're doing it right, or why they do it in the first place. And if they work up the courage and speak up, management denies the problem exists, defends the status quo, and ignores the problem, and mark the person as having an “attitude”. As a project manager, you should strive to make each day more productive than the last. The more you work, the more you can learn and optimize the process. This takes time and creative thinking. You can't just decide to improve things - it should come naturally, out of a desire and a need to be more efficient. As you work, try out new things and experiment. Most experiments will fail, but it's the only way to become better. This sometimes means more dreaded meetings. But unlike other meetings, this one’s an investment. You’ll learn what common problems are and your team will have a chance to suggest how to fix them. The best time for those meetings is when a project is finished. Then you can sum up your experience and have a chance to analyze your work, without looming deadlines breathing behind your neck. Team resistance is a burden you'll have to deal with every day. But always keep in mind that a project manager is equally important as the other roles that create tangible value. Without project managers, the whole project would spiral out of control, teams would fight for resources, and no one would get paid because they wouldn’t have who to work for. Everyone managing developers and designers should read Peopleware. Do a favor to yourself and your team and read it right now. It'll be the best time investment you ever made. A project manager’s job is not measured in how much they work but how much their team accomplishes. If all you do the whole day is twiddle your thumbs and make coffee, yet every team you manage outperforms other teams, you're doing a good job.